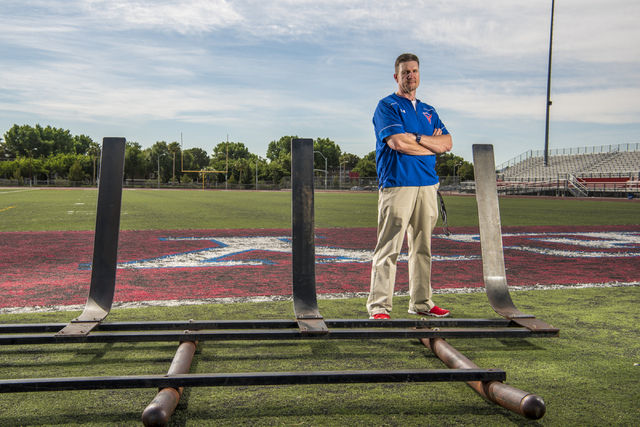 About a month ago, Valley High School football coach George Baker set up an account on GoFundMe to raise money for a new blocking sled and other equipment. He has raised $5,100 and will order the blocking sled soon. 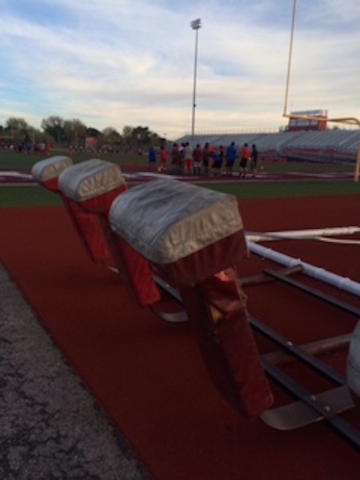 At the scoreboard end of Piggott Field on the Valley High campus in central Las Vegas sits the skeleton of what 34 years ago was a state-of-the-art blocking sled. It serves as a tarnished reminder that Valley has fallen upon hard times in football. It’s going on three seasons since the Vikings last won. Urban sprawl sometimes is harder to defend than the triple option. 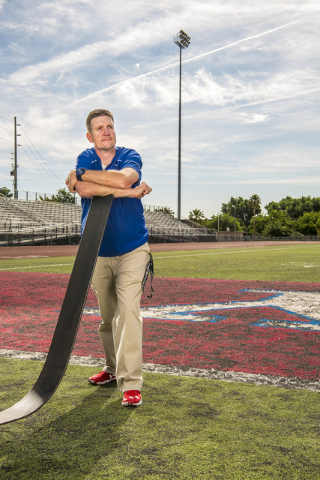 This was the reality George Baker encountered when he returned to Southern Nevada for his second stint as a high school football coach. 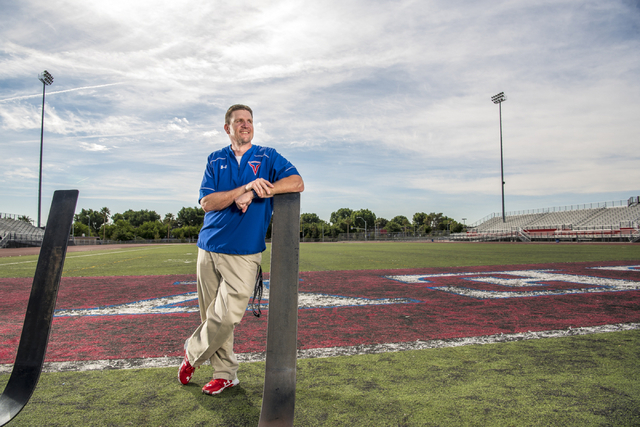 Before leaving for a job at Reno’s Damonte Ranch High, Baker was the coach at similarly well-heeled Centennial on the manicured northwest edge of Las Vegas. Were there a blocking sled in disrepair at Centennial, Baker said he could have just asked the booster club for a new one or set up a benefit golf tournament. The demographics and dynamics are much different at Valley than when the school opened in 1965. Or even 20 years later, when Greg Maddux played baseball there. “We could do a car wash,” Baker said. 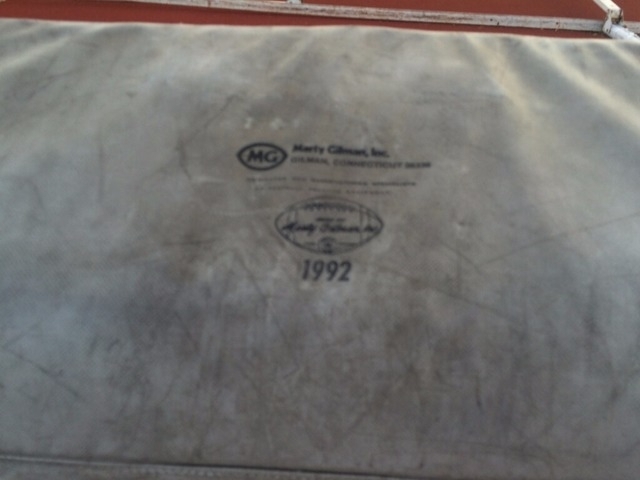 A blocking sled off the lower shelf (read: not the kind they use at Bishop Gorman) costs around $5,000. If this were Detroit, and the Valley kids were allowed to wash the cars as they came off the assembly line, that might have worked. At schools such as Valley, it often takes a more creative fundraising approach. No wins in three seasons isn’t an accident or an illness. But it seemed like a challenging circumstance. So Baker set up that account and posted a cover letter explaining the situation at Valley. He put up a lot of pictures that showed the tattered condition of the blocking sleds and the other ancillary equipment that could help him in changing the culture, as coaches like to say. He listed $20,000 as the goal. Was that too much to ask? Baker really had no idea. So far he has raised $5,100 — just enough to pay for a new blocking sled with hopefully a little left over to tip the guys who deliver it. Baker said donations have slowed to a trickle, which was to be expected. He said he would leave the page up on GoFundMe for another week or so, because the top of the old tackling dummy also has ripped open, and the stuffing is coming out, and it would be nice to have a new one of those as well. As of Wednesday, 64 people with kind and generous hearts have pledged money for a new blocking sled. Baker said he wanted to thank each one, and where applicable — some donors were anonymous — he will do it in person. Many who pledged (https://www.gofundme.com/4yuqn8fw) are Valley graduates. One was a former referee. Baker said he wanted to thank him, too. He said he would pay the generosity forward not only with effusive thanks but also by taking his players to the Las Vegas Urban League mission one Saturday to volunteer. George Baker said he had misgivings about asking for a blocking sled subsidy when he came across GoFundMe messages from the loved ones of cancer victims who only were seeking money for proper burials. But when he saw a request for financial supplication for Kanye West, who reportedly is $53 million in debt — and that people were pledging money — he felt more at ease. Baker, a youthful-appearing 45, grew up in Steubenville, Ohio, in lengthy shadows cast by Pittsburgh. You still can sense his blue-collar rationality. He actually wanted the Valley job, and the challenge of rebuilding the program. He said he loves his new principal, Ramona Esparza. Baker graduated from Youngstown State when Jim Tressel was coach. When you call Baker’s cellphone, and he’s not available, you get a stirring rendition of “Across the Field,” the Ohio State fight song. 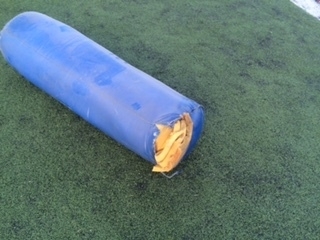 But across this field — field turf that has pebbles coming through to the playing surface and also is showing its age — there sits only a skeleton of an old blocking sled soon to be replaced, thanks to some outside-the-box thinking by a gung-ho coach and a full backfield of kind and generous hearts. The Valley kids are gonna love hitting the new sled (relatively speaking) when two-a-days roll around, George Baker said. “Are we going to be state champions? Probably not.